The National Youth Service Informal settlement Slum Upgrade Initiative has greatly supported the transformation of slums in and outside the city not only for the benefits of communities but also inspired the youths integrated in the programme. This initiative was started by the National Youth Service, in coordination with local youth volunteers from the informal settlements, which ensured that growth is possible in run down informal settlements. The initiative would include cleanup of neighbourhoods, sewers, construction of toilets and washrooms and trenches. The face of Mathare’s is gradually changing to a better place from insecurity related issues, poor sanitation to youth and women employment. 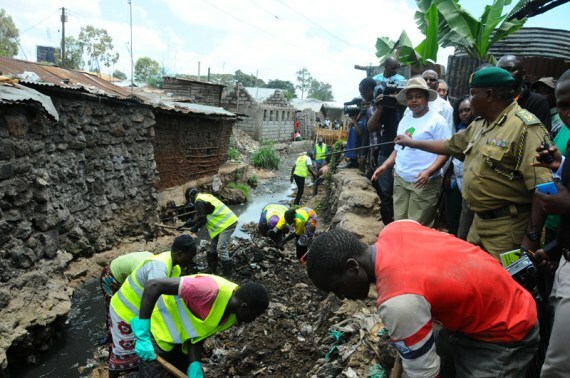 This programme was greatly attributed to absorption of many youths and women into the National Youth Service (NYS) programme of cleaning the slum. In recent times corruption allegations and questions on various procurement and payments made by key youth service officials is a wakeup call for citizens especially the youth to get involved in participatory governance, since in most cases good intentions may be soiled by selfish personal gratification. In spite of these challenges, one of the incredible and motivational factors about the initiative is that the local youth volunteers created a mutual nexus with the NYS service men and women to transform their communities, regardless of the what settlement one comes from. Prior to being integrated into the project, we had to undergo training for about one week or less. Increasing the number of recruits, enhanced training and involvement of the youth service in slum areas such as Nairobi’s Mathare have been appreciated by fellow youth and considered a step in the right direction in nation building. However, with the ongoing corruption investigations against top officials of the Devolution and Planning Ministry and with all scheduled youth programme activities put on hold, the face of our informal settlements have continued to lose their ‘make up’. Every informal settlement recruited about 3500 community youth to work under NYS servicemen; they will then earn a little stipend and propose development projects. In Mathare there are 12 villages in Mukuru Kwa Njenga there are 8 and in Korogocho there are 9, in Kiandutu there are 9. Each of the settlement was to receive, a beyond zero clinic to cater for women and improve maternal health , a police post, fish tanks, 6 ablotion blocks in each, each house hold will in turn receive agriculture sacks that they can grow vegetables in, all pre existing access ways, footpaths, road and bridges were to receive a face lift . Cleanliness in Mathare seems to be drastically changing from good to worse. Mathare had begun to improve in sanitation and hygiene standards due to NYS‘s daily cleanups has now turned into a huge garbage dump. Streets drainage ways, footpaths and river riparian are all littered with piles of garbage as residents who are supposed to be the entitled conservationists, don’t care anymore and continue to trash carelessly just because the Mathare Youth Service is no longer in service to clean after them. However, this begs an important question, were we keeping our settlements clean for the government? Youth from Nairobi’s slums religiously engaged in the cleaning of drainage systems and sewer lines, construction of toilets and collection of garbage, among other activities, they went a step further and formed youth saccos where their daily savings are remitted. Presently all these efforts seem extinguished. In every area I have visited so far, I came across large mounds of garbage which is continuously pilling and it will soon become a garbage site. We used to clean up all these areas and a lorry from the NYS would be dispatched to clear of the garbage on a daily basis. Dump sites such as these are found all over Mathare and have begun to pose serious challenges to business owners who operate on the streets and road sides selling all kinds of food stuffs. The increasingly foul smell.insistent flies and hygiene risk drive many potential customers away, I spoke to one food vendor who sells chapatis across the street,’’if this situation continues without a solution more than just business will be at risk as every slum resident will suffer from sanitation related diseases like cholera and typhoid. When it rains the clogged drainage ways halt the flow of water and some houses get flooded with dirty drainage water, one would assume that this dilemma has gotten worse due to the El-Nino. We all go back to the transfer of responsibility—I wonder who will come to our rescue?